Now that your plans are finalized and we have your signed contract with deposit, we will finalize the necessary plans and specifications required by the county or city for permit application. These documents will be delivered to the proper authorities, along with the payments required to obtain the permit(s). Obtaining permits typically varies from 2 to 6 weeks. The initial phase of our work involves preparing the area for clear access to the site which may include removing cage screens, cutting out decks, exposing plumbing, relocating items, protecting existing items from damage, staging landscape items for re-purposing later, and delivering equipment to the site. We will drain the pool and stage your new rock. By the way, when the rock arrives, it will look as if we have ordered much too much. This is partially an optical illusion. It takes a lot of rock to build a waterfall. For every foot of height, there must be lateral space filled with rock for support. In fact, there is a lot more than “what you see” when we build the waterfalls, walls and planters. Once all the prep work is done, our stone masons go to work. All the major stones are placed by Lucas. We install all of our plumbing lines and conduit for lights and irrigation as we build so that nothing is visible at the end of the job. If you have chosen our Fieldstone coping, this will be installed now as well. 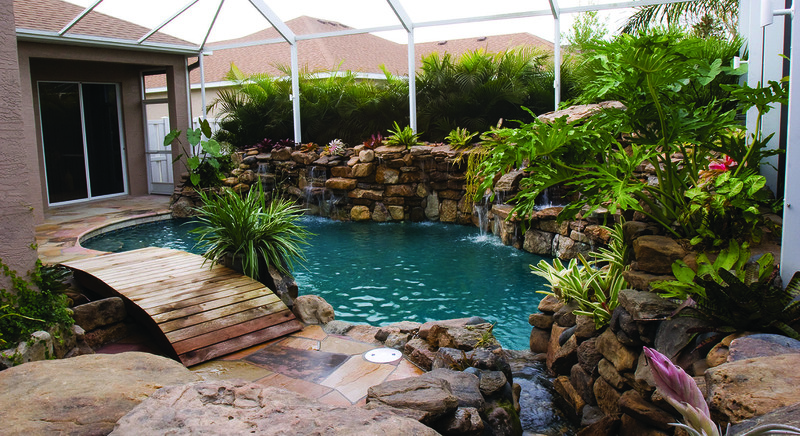 If you are having the interior finish of the pool redone, we will remove the old coping and tile, add new coping and tile, grind around all the fixtures in the pool, and seal everything with hydraulic cement to assure that there is no leaking. After the major rock work is finished, our pool plumbing specialist will install the rest of the required piping along with all new equipment. Once the stone work is complete, or almost complete, we begin on the deck. Depending on the material selected and the area to cover, this can take from three days to three weeks. Remember, if you have chosen flagstone, every piece of flagstone will have to be cut by our stone masons to create a very tight fit. Our licensed electrician will then hook up all new and old equipment. If you need more power at the sub-panel to run extra pumps or other equipment, he is qualified to do this work. All landscape plants, as well as, micro-irrigation will be installed at this time. After the landscape is planted, the lighting will be installed to highlight the various features of your new lagoon. After the rock work and landscaping are complete, the whole site will be cleaned up. All excess rock will be removed. Irrigation will be repaired or installed. A couple of days before the interior finish is to be applied, the crew will clean the pool completely and “bond coat” the whole pool to insure that the new finish adheres to the old pool shell. If there are hollow spots due to poor initial construction, these will be repaired. The interior finish is mixed on site and applied with trowels. Don’t worry if the color you see is very different from the sample you picked. You are seeing the color of the grout, not the stone. The next day one of the crew will return to wash down the walls and expose more of the stone. Over the next few months, as more and more of the stone is exposed, the color will become richer and richer. After the stone is washed down, we will begin filling the pool. Please let the water run until the pool is completely full (half-way up the skimmer). By this time, we are as excited as you are to see everything operating. Lucas will be on-hand to turn on the falls for the first time and make any adjustments to the various flows. We will also have one of our crew, who is experienced in balancing out the pool chemistry, add the initial chemicals to begin this process. Please let the pool run 24 hours a day during this process. When everything is running, we will walk around the whole project with you and make note of anything with which you are not satisfied. Any deficiencies will be corrected immediately and you will also receive instruction on how to maintain your new lagoon. Now that the construction traffic is over, we will repair or replace any sod we caused damage to during the project. We warranty our work for two (2) years!!!! We are that confident! And we use only top-of-the-line pool equipment which generally comes with a three (3) warranty backed by the manufacturer’s certified technicians. It has been our experience that, in the rare event this equipment has a problem, the technician’s address the situation immediately. No matter the size of your project or where we are constructing it, a Custom Lucas Lagoons pool remodel will take less time to build with a whole lot more detail than the average pool company… but, then again, we’re not average!